The Turbine makes pretty big claims about improved airflow, and celebrity endorsement from the likes of Tour de France champion Chris Froome, but Techly isn’t convinced that the fairly messy trade-offs are worth the marginal gains. Every endurance athlete will admit, in their weaker moments, that they will happily buy performance improvement when they can. The unending search for better equipment, to give you that extra edge, drives billions of dollars worth of spending each year on running shoes, bikes, aerodynamic gadgets, nutrition products for performance and recovery. Nike were awarded 540 patents in 2013 alone. Lighter, faster, stiffer, more aero, more expensive. Products ratchet up their performance claims relentlessly each year, giving the people buying them an excuse to upgrade. And why not? Most people competing in endurance events (and certainly the ones buying their own equipment) are firmly in the amateur ranks, where the time available for training imposes severe limits on what performances are possible. You’ve got to look for advantages where you can. ‘Marginal gains’ is the phrase at Team Sky press conferences, the philosophy of adding up all the little 1% differences until they make a big difference to your overall performance. ‘Every little helps’ as another famous British brand puts it. It’s a philosophy that fits for manufacturers with things to sell. I mean, if all of these tiny things make such a big difference, you can’t afford to neglect them, no matter how tiny, can you? I know all about this stuff. I’m a washed-up former middle distance runner who switched to cycling because the opportunities to buy expensive carbon fibre things are better. And so I’m reviewing The Turbine. This Chris Froome-endorsed gadget goes up your nose and claims to improve airflow through your nostrils by a whopping “up to 38%”. It’s got a fleet of high-profile international stars being photographed wearing it: Jack Bobridge, Robbie McEwen, and more. The Turbine resembles one of those nose clips used by synchronised swimmers, but does the opposite thing: you stick it up your nose and it opens ups your nasal passages. Pretty simple, really. It comes in three sizes, and a starter pack containing one of each will cost you AUD$19.95. When you’ve decided on your size, a three-pack costs $29.95. Each Turbine can be used up to 10 times, so that’s near enough to $1 a go. It’s made by Rhinomed, a Melbourne-based medical devices company that also offers a similar device called Mute, which is designed for people with mild to moderate sleep apnoea. The company is conducting clinical trials into its effectiveness as a sleep-aide. But does The Turbine help performance? Well, we all know that getting enough oxygen is a critical part of any sport where you’re operating at or near your aerobic capacity. Sounds good, right? After snapping a few photos of the rubbery yellow devices, I opted for the medium and inserted it into my face. 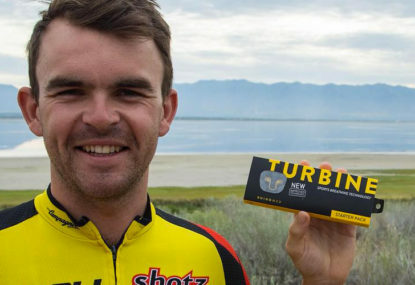 Head over to Techly to read Tim’s full review of The Turbine, and who he recommends it for.